For attendees, destination appeal is a key factor in going to a meeting. San Diego’s historic sites provide authentic experiences that educate and entertain. Book San Diego, where history becomes a highlight of your guests’ experience. Witness the living legacy of California’s birthplace in Old Town San Diego State Historic Park. Its many preserved historic buildings and museums commemorate the early days of San Diego from 1820 to 1870. Attendees can experience California’s history firsthand. A visit to San Diego’s only national park, Cabrillo National Park, offers tremendous views of the region and excellent opportunities to explore the natural, historical, and cultural history of the area. Spend an afternoon walking in the footsteps of Juan Rodriguez Cabrillo on his first landing in California. Chicano Park is home to one of the largest concentrations of Chicano murals in the world, with more than 80 paintings on 7 acres dotted with sculptures, gardens, picnic tables, and playgrounds. Host an outdoor event there so attendees can experience the multicultural importance that this Mexican-American neighborhood has for the region. Originally a naval training center, Liberty Station is a sprawling complex of historic buildings housing restaurants, theaters, museums, artist studios, boutique shops, special event venues, and expansive outdoor plazas. Incorporate its military history into your program with a one-of-a-kind event for your next meeting or event. The Maritime Museum of San Diego offers a variety of venues available for corporate events, receptions, conferences, and even sailing charters. There is no better way to showcase San Diego’s dramatic waterfront than an evening sunset program aboard a historic ship. 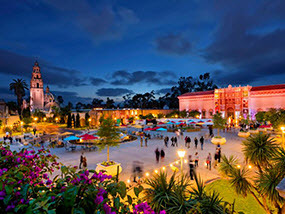 Balboa Park provides a spectacular backdrop for meetings and events, including 17 museums, tranquil gardens, and the world-famous San Diego Zoo. Located just blocks from downtown San Diego hotels, the park has a rich history reflected in its stunning architecture, art installations, and cultural events throughout the year.